TEHRAN (IrTAG) — Channel 10 of Israeli TV reports that during negotiations with the Russian delegation, Israel rejected the proposal that the Iranian forces in Syria will keep at least 100 km away from the Israeli border. The government spokesman stressed that Israel continues to insist that Iran should not be allowed to create a foothold in Syria. Moreover, Israel demands that any long-range missiles be removed from Syrian territory, and all factories for the production of precision missiles be shut down. In addition to this, Israel requires Moscow to guarantee that the air defence systems deployed around such facilities be removed from Syria. Finally, Israel demands to close the checkpoint on the border of Syria and Lebanon and the checkpoint on the border of Syria and Iraq in order to prevent the smuggling of Iranian weapons into Syria. 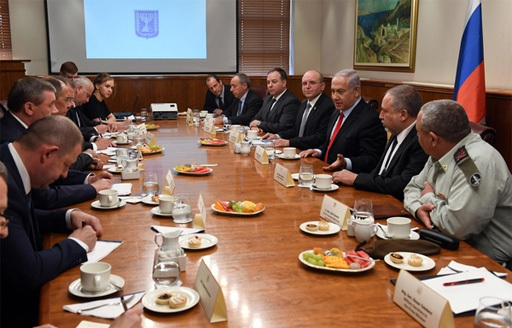 In the meeting, apart from Netanyahu and Lavrov, Defence Minister Avigdor Lieberman, National Security Adviser Meir Ben Shabat, Chief of the General Staff of the IDF Gadi Eisenkot, and Chief of the General Staff of the RF Armed Forces General Valery Gerasimov participated. Our relations are extremely important and are realized, as you saw, through direct meetings between me and President Putin and between our teams." And I greatly appreciate the statements made by President Putin and President Trump about Israel’s security. recent summit. The Israeli representative said that Russia “promises” to create a security zone of 100 km from the Israeli border, and added that this is “a first step”, while Israel will continue to take measures to prevent the strengthening of Iran “in any part of Syria”. Iran is determined to turn Syria into the second Lebanon. We do not intend to admit this. The Russians listened to us very carefully. They knew our requirements, but today they received a very large amount of detailed information.